Inflammatory airway disease is a chronic inflammatory condition of the lower airways of young horses characterized by chronic cough, excess mucus in the trachea, and mild exercise intolerance. Horses with IAD have normal attitudes, appetites, and temperatures and do not exhibit increased respiratory effort at rest. Inflammation and mild airway obstruction with mucus occurs in the bronchi and bronchioles resulting in bronchitis and bronchiolitis. It is often caused by substances that irritate the airways such as molds, dusts, noxious gases, or pollutants. A general physical examination with attention to the respiratory system may or may not show that there is some clear or white discharge present in the nostrils. Listening to the lungs and trachea may reveal harsh sounds, crackles, wheezes, or fluidy sounds in the trachea suggestive of the presence of mucus or lung sounds may be normal. When horses lung sounds are quiet a rebreathing bag exam is performed. A bag is placed over the horse’s muzzle and he is asked to breathe only the air present within the bag for a short time. The result is slower and deeper respirations that accentuate the lung sounds especially if abnormal sounds are present. If abnormal lung or tracheal sounds are identified an endoscopic examination of the airways is recommended. The endoscope is a camera that allows us to directly visualize the upper airway structures (nasal passages, pharynx, larynx) and trachea. Structure and function of the upper and lower airways are evaluated and the presence of mucus or other abnormalities is identified. If mucus is seen in the trachea a bronchoalveolar lavage (BAL) can be performed to diagnose IAD. A long thin tube is passed through the horse’s nose into the trachea, primary bronchi, and into the lower airways. The lavage is performed with saline solution that is washed into the airways and recovered with a sample of cells, mucus, and any contaminants that may be present. The sample is spun down in the lab and a cytologic examination is performed to evaluate the contents. Environmental changes, feed changes, and/or medications are prescribed depending on the endoscopic examination findings and the cytological results from the BAL. A primary goal is to improve ventilation and decrease dust in the horse’s environment which can be accomplished by outside turnout, stalling by the open barn door or in stalls with windows, sealing hay storage or not storing hay above the horses’ stalls, wetting or soaking hay fed to the horses, and switching or supplementing the diet with forages. Antitussive (cough) medications, systemic steroids, and/or inhaled steroids, bronchodilators, and mast cell stabilizers may be prescribed as treatment. 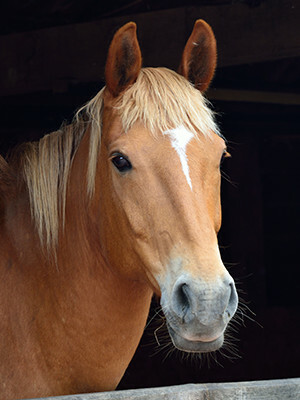 Respiratory problems are common in horses and coughing is a common clinical sign of equine respiratory conditions. Although your horse’s cough does not sound serious, diagnosing the reason for the cough and addressing the cough with a specific treatment is advisable. Future problems can be prevented and your horse’s performance level may improve. 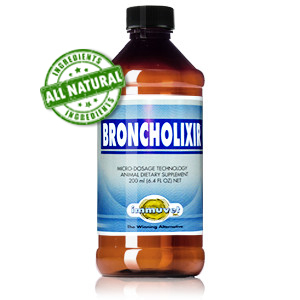 Broncholixir™ contains a synergistic blend of compounds that provides a high level of bioavailability and bioactivity of its primary ingredients (present with the initial dose).